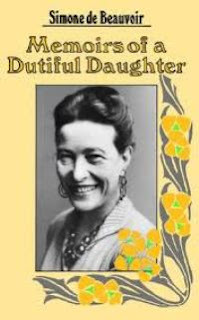 ORIGINAL TITLE: "Mémoires d'une jeune fille rangée"
CHALLENGE: “A-Z”, "Women Challenge", "European Reading Challenge", "Books on France", "Library Books"
SHORT INTRO: Childhood and adolescence mark the almost fictional plot of “Memoirs of a Dutiful Daughter”, the first part of Simone de Beauvoir’s autobiography. The necessary steps of a sentimental education, the inevitable clash with the family, the social environment of the French conservative and self-righteousupper middle class, the base prejudices of a declining world along with the first doubts, the sentimental conflicts, the tensions. All these elements mark out Simone’s journey towards the conquest of herself, until the university years and the meeting with some of the most famous actors of the French culture, like Simone Weil, Raymond Aron, Merleau-Ponty, Roger Vailland and Jean-Paul Sartre, who would later become the most important person in her life. WHY I READ IT: Someone (thanks!!!) had suggested it as the next book to the reading group of SalaBorsa Library and the majority voted for it. I love this way of approaching book, which, otherwise, would wait for me for long. MY OPINION: At first it was devastating; not because the book is sad, but because I didn’t like it, I couldn’t make it mine. The story is chronological, a sort of diary, a collection of thoughts. The first part is dedicated to the child Simone. Then, slowly, it thrilled me more and more. As Simone grew up, my interest in her story increased, I also gathered information on her from Wikipedia and I discovered a whole world. What a woman! I went on reading the book with even more enthusiasm, sometimes I envied (in a good way) this girl who had the opportunity to grow up in such a stimulating environment. Obviously life was not a bed of roses as the author explains, but those years and that environment seemed to me soaked with culture: how much I would have liked to enter into the book and be there with her in certain moments! Her autobiography is told in 3 other books, I’ll get them as soon as possible, it was difficult to leave her. This book was only the first part, the intellectual and emotional reworking of the first twenty years of her life.